Don’t let product failure from breakage stand in the way of your product’s success. Design your application with impact resistant TPEs. What is Impact Resistance and how is it measured? 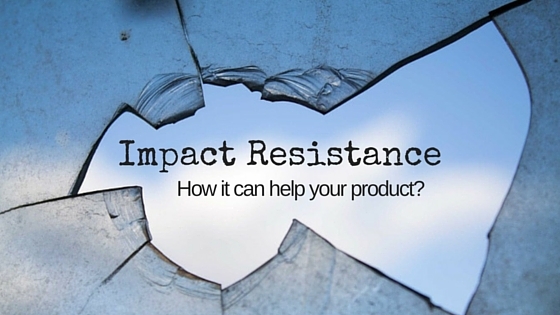 Impact resistance is a way to measure how well a material or product will do when dropped or attempted to break. It’s a value for its ability to absorb energy without breaking. It’s important to note that impact resistance is different vibration damping which is the ability to absorb shock. Impact resistance is important when your application is highly used and abused like lunch trays, storage containers, or reusable pallets. If your application would benefit from impact resistance, take that into consideration during the material selection process (versus later in the design process). Incorporating this property into your design can result in finished product that resists breakage when dropped, hit, or otherwise encounters impact. It’s measured by an izod impact tester and it capture the amount of energy that the sample absorbs. The tester has a large lever arm that is released and on the down swing, it tries to break the sample that was previously placed in the holder. The more energy that is absorbed the higher the impact resistance rating on the scale. The machine give out a reading after each test in the foot pounds unit. This is a unit of energy that can be converted to kiljoules (kJ). How can plastics be enhanced for Impact Resistance? TPEs can be functionalized for different environments and applications. During the compounding stage different additives can be combined to enhance a TPE to fit the functional needs of your application. For impact resistance, there is an additive that encourages the cross-linking when it cools. It is commonly used when the product application is repeatedly dropped and needs to be reused without breaking, such as a milk crate. What effect does Impact Resistance have on other properties or processing? We have not found that impact resistance additives have any effect on specific gravity or hardness. However, we have found mild correlations to tensile and tear resistance. The additives are non-hazardous and can be sticky during the processing stage. No need to worry about that though because we have it handled for you. If you would like to know more about Impact Resistance let us know in the comments below. It is not a standard test but can be performed upon request.